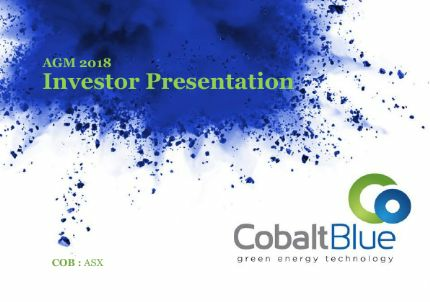 Sydney, July 4, 2018 AEST (ABN Newswire) - Broken Hill Prospecting Limited ( ASX:BPL) ( OTCMKTS:BPLNF) is pleased to acknowledge receipt of the Pre-Feasibility Study (PFS) from Cobalt Blue Holdings Ltd ( ASX:COB) ( OTCMKTS:CBBHF) as Manager of the Thackaringa Joint Venture (TJV), details of which have been released by COB this morning. - The PFS delivers strong results for the world class Thackaringa Cobalt Project, located on BPL's tenements near Broken Hill, NSW. - COB submitted to BPL that it had met its TJV Stage 2 Hurdles. The TJV Management Committee has appointed an independent expert to review the PFS, confirming COB's submission that Stage 2 Hurdles have been satisfied. BPL will advise in due course the outcomes of this review. - The PFS places a significant value on BPL's royalty on cobalt production at Thackaringa. BPL is reviewing the underlying royalty calculations and will advise the outcomes of that review in due course. - The PFS confirms the Thackaringa Cobalt Project is of global significance as a sustainable, low-cost source of high purity cobalt sulphate for the battery revolution and recommends advancement to bankable feasibility studies. 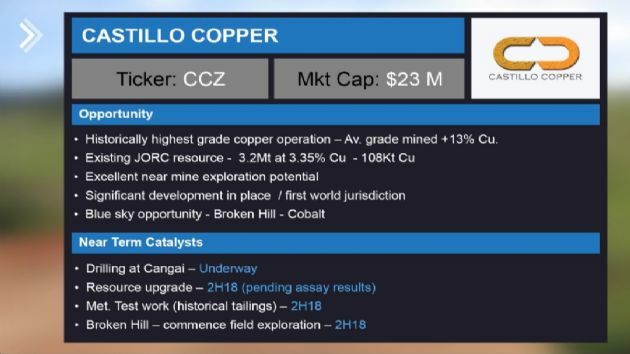 "Cobalt Blue's PFS demonstrates a robust project with excellent commercial metrics and potential for improvements as the project moves through bankable feasibility studies. The projected commercial return to BPL from its royalty under the Thackaringa Joint Venture can now be assessed with some accuracy. This is an excellent outcome for BPL shareholders. "BPL is conducting its technical review of the PFS and assessing COB's claims to have met its A$2.5 million expenditure obligations under the TJV Stage 2 Hurdles. COB can earn an interest up to 100% of the Thackaringa Cobalt Project if it completes a four-stage farm-in. To do so, COB must commit $10.9 million in project expenditure before 30 June 2020 and pay BPL $7.5 million in cash. BPL is further entitled to receive a 2% net smelter royalty on all cobalt produced from the Thackaringa tenements for the life of mine and retains rights to certain intellectual property (patent processing technology) developed by the TJV. Further details of are included on page 3(see link below). Based on COB's PFS, BPL's 2% royalty is anticipated to deliver approximately A$43 million to A$48 million revenue over the anticipated life of mine. BPL is looking forward to advancing the commercialisation of the new technology. The patent application made describes a process for recovery of metal from pyrite-bearing material. This process potentially has broad application throughout the world. It comprises thermally decomposing pyrite to produce pyrrhotite and elemental sulphur, and then leaching the pyrrhotite to extract the target metal. Under the terms of the TJV, BPL retains the rights to base and precious metals on the TJV tenements, where it's actively exploring for Broken Hill (Pb-Zn-Ag) style mineralisation. BPL's recent market announcements detail geological mapping combined with newly acquired high resolution geophysics, which greatly enhance the understanding of the district's geological framework and will support future base and precious metal exploration at Thackaringa. 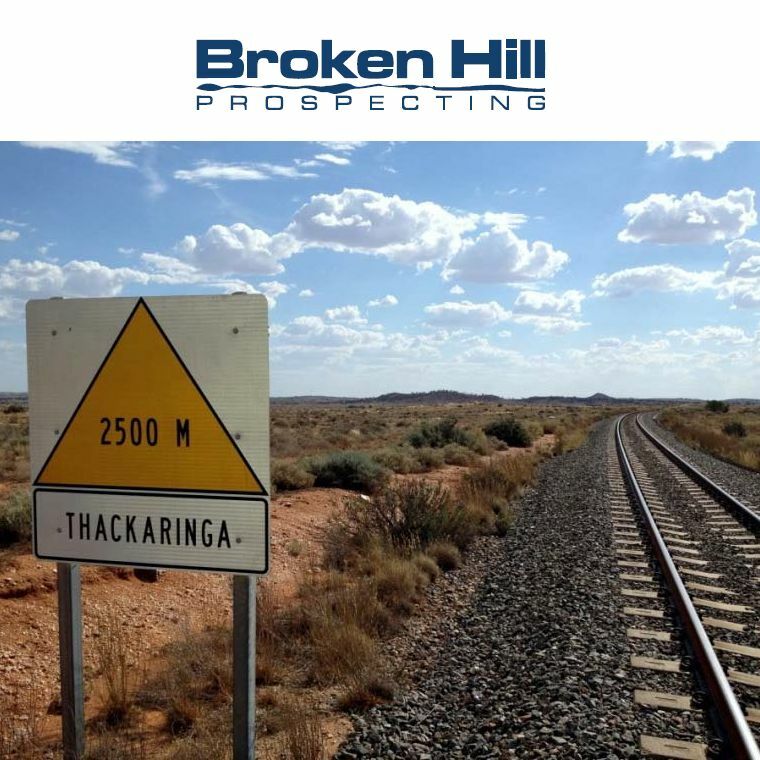 The Broken Hill Group, which hosts the world class Broken Hill Pb-Zn-Ag orebody comprising 300Mt of ore containing 30Mt Pb, 24Mt Zn, 1B oz Ag and 1M oz Au, is widely distributed across Thackaringa with multiple prospects prioritised for further exploration. 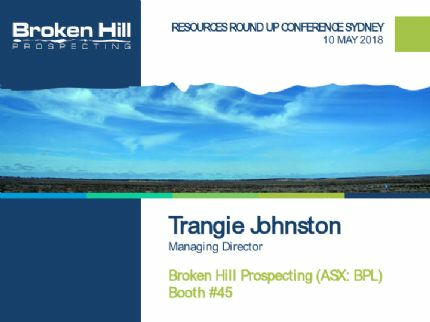 Newly discovered prospects characterised by outcropping quartz gahnite rock, a key vector for Broken Hill Pb-Zn-Ag style deposits, has greatly expanded BPL's search for these world class deposits. In addition, BPL shareholders received an entitlement to a 1:4 issue of COB bonus options (total: 8,750,000 options). The current value of this distribution is approximately A$42 million based on COB's current share price for those shareholders that retained their COB equity.